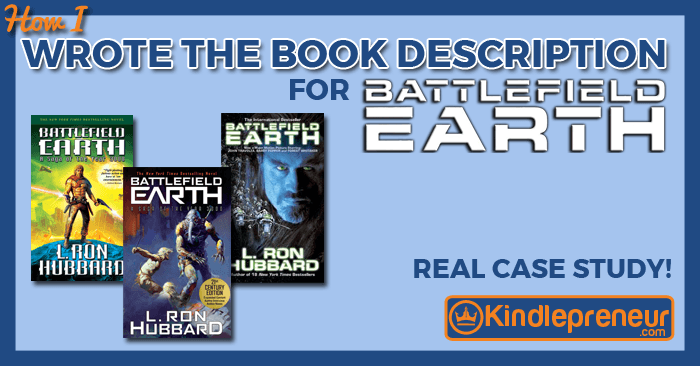 A while back, I got an email from Galaxy Press, L.Ron Hubbard’s publishing company, asking if I could help them with the marketing of one of his most famous books, Battlefield Earth. 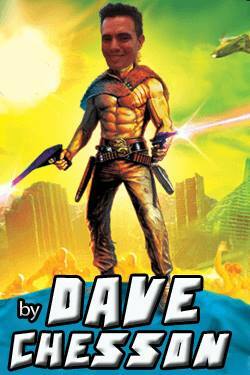 Now, if you don’t know me well, I’m a HUGE sci-fi nerd and list Battlefield Earth as one of my all-time favorite books – not the movie. And wow! Was it ever a fun book marketing exercise. Immediately upon accepted, I looked at their Amazon Marketing Services (AMS) statistics and results. What I saw was that they were doing a great job at getting their book in front of the right customers (as I teach in my free AMS video course: AMSCourse.com). However, they weren’t getting enough people to purchase. Their conversion rate was very low. When this occurs, 99% of the time, its because the book description isn’t good enough. With this particular book, this was definitely the case. It was more like a book report and failed to drive curiosity, and depth to the story. So, I got to work, rebuilding a book description that would sell, and chronicled everything I did below. And the results? We 3x their conversion rate…all because of some simple changes to the book description. In this article, I’ll show you exactly what I did, my mistakes, and even the final product. B. Podcast Episode on Constructing a Book Description. My interview with Bryan Cohen on the Book Marketing Show podcast. C. Kindlepreneur’s guest post on Back Book Cover Blurbs, written by Kelly Exeter. I especially loved the fiction book description formula she describes, and I went to work applying it. After refreshing what goes into a good book description, it’s time to gather useful data and building blocks to create a description that turns shoppers into buyers. Since I read the book back when I was 12, I knew what the book was about. However, I needed more than just my own memory. 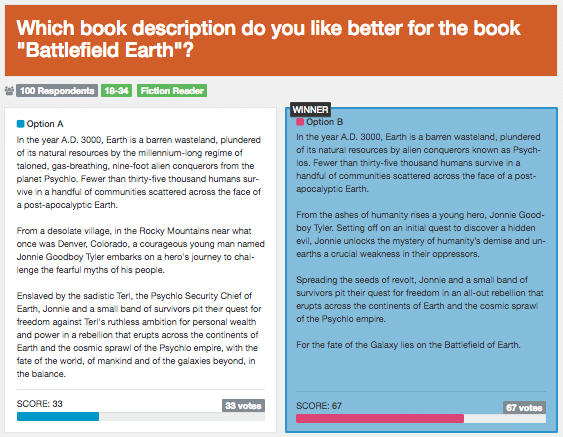 The best strategy for writing a description that makes people buy is not only knowing the book, but also finding out what people say was their favorite part of the book, and expanding on that. One of the best ways to convince a shopper that this IS the book they are looking for is to make sure you use their own words to describe the book. For instance, if the buyer searched Amazon using the term “swashbuckling adventure” and your book description says “this swashbuckling adventure…” somewhere in it, then you’ve now proven to the shopper that they found the kind of book they were looking for. Therefore, knowing what words shoppers use to describe the kind of book they are looking for can help you write better and engaging book descriptions. Also, this information will help get the book in front of more shoppers because as Amazon’s A9 algorithm publicly states, they look at the words we use in the description and choose where to show books. 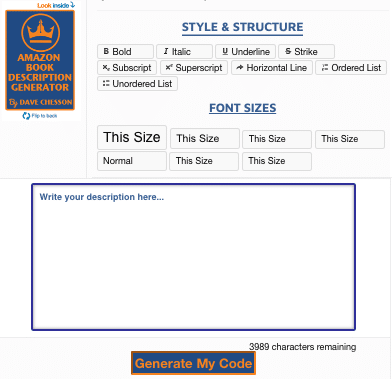 So, doing this research and using the words in your description will als0 help your book show up more on Amazon. It gave away too much information and lavished in details – this is a sales page book description, not a book report. This description makes it sound like the book is more about Jonnie and Terl fighting against each other. As a reader, however, I know it’s about more. There is much more at stake, and the focus on and description of Terl is a little too drawn out. The sentences ran on and weren’t engaging enough. So, I took these observations and my notes from other sites to create an updated book description. I shortened up the first sentence because it was too detailed and drew on. However, it was important to let the shopper know this is a post-apocalyptic book. Ended the description with a heavier statement that impresses upon the reader the importance of this single battlefield. This isn’t just about mankind versus the Psychlos…it’s about more and you need to purchase and read this to find out. After you are sure you have a better book description, it’s time to make the description looks good on Amazon. The book converts 3x better. That means 3x more people who come to the book’s sales page on Amazon choose to buy the book. That’s an INSANE difference by itself. They loved the book description so much, that in the next edition of the print book, they will be using mine on the back book cover. 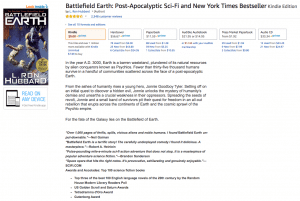 The last sentence is now used as a slogan for the book: “The Fate of the Galaxy Lies on Battlefield Earth” with the words Battlefield Earth being the title. 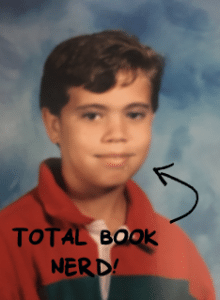 Is my book description holding my book sales back? Am I missing out on the perfect customer because after all my marketing efforts, they come to my sales page and aren’t convinced that this IS the book for them? If so, then perform what I just did and find the right description for your book. And that’s how I wrote the book description for a super famous book (that I happen to love). This uber nerd got to work on one of his favorite books and help so it will sell better. Curious to know another total nerd secret about me? Check out which MasterClass I took after checking out all the courses from top-notch authors.